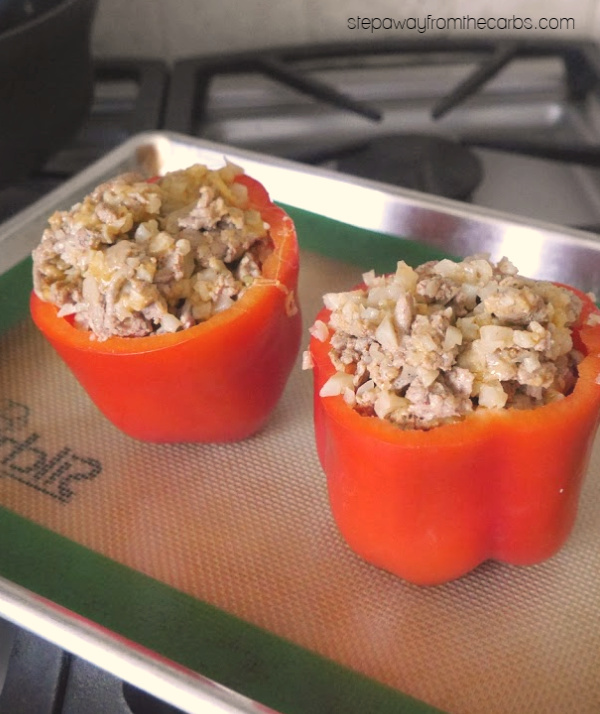 These low carb stuffed peppers are filled with ground turkey, cauliflower rice, and cheese! A really tasty recipe to enjoy for lunch or dinner! Did you see my recent announcement about my new book? 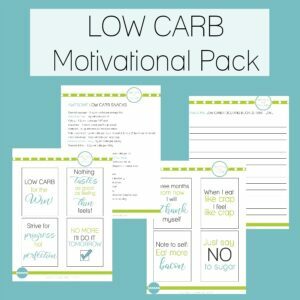 Low Carb Meals with 5 Ingredients or Less is NOW ON SALE! And I bet you recognize the photo on the front cover – yes! 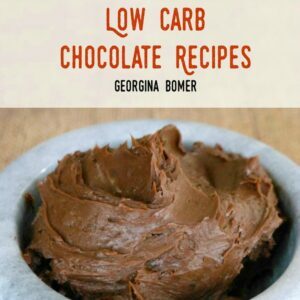 It’s THIS recipe! 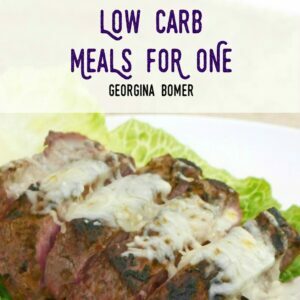 I really wanted to highlight how easy it is to make delicious low carb meals with only a handful of ingredients, and to demonstrate the kind of recipes that you’re going to find in my book. I’ve made stuffed peppers once before on the blog: Low Carb Halloween Peppers (with cute jack o’lantern faces!!). They featured a combination of cooked chopped chicken and cauliflower rice. 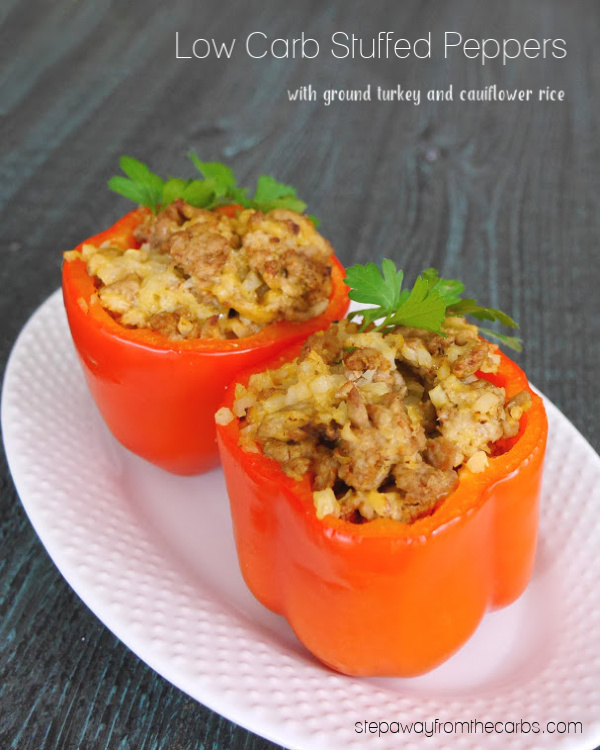 This time I wanted to work on a similar recipe, but using ground turkey instead. 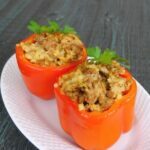 In the previous recipe, I boiled the bell peppers before stuffing and roasting, but I’ve omitted that step in this version – mostly due to laziness, I confess! But I really liked the contrast of the crunchy “shell” and the soft filling, so I think that’s how I’ll do it from now on. But obviously, if you prefer, just boil the peppers in water for five minutes (after you have hollowed them out). 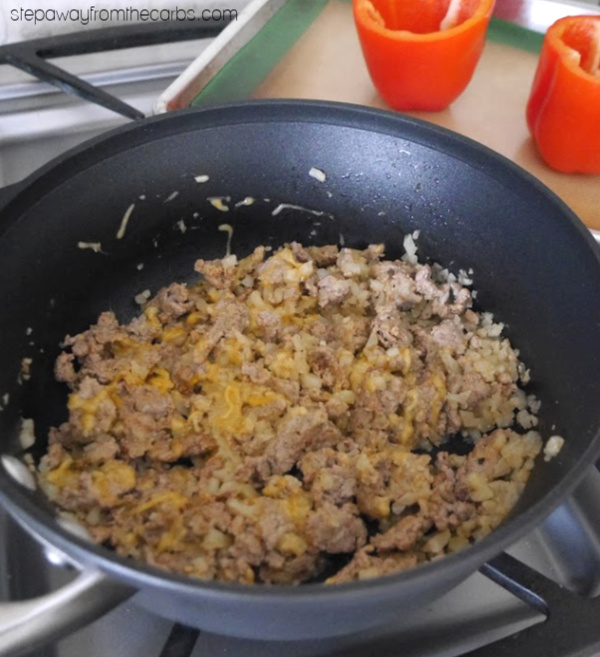 To make the filling, add some oil to a pan and cook the ground turkey until browned all over. Add some paprika and riced cauliflower (you can make your own (see my tutorial) or buy it ready riced for extra convenience! Continue to cook until the cauliflower is tender. 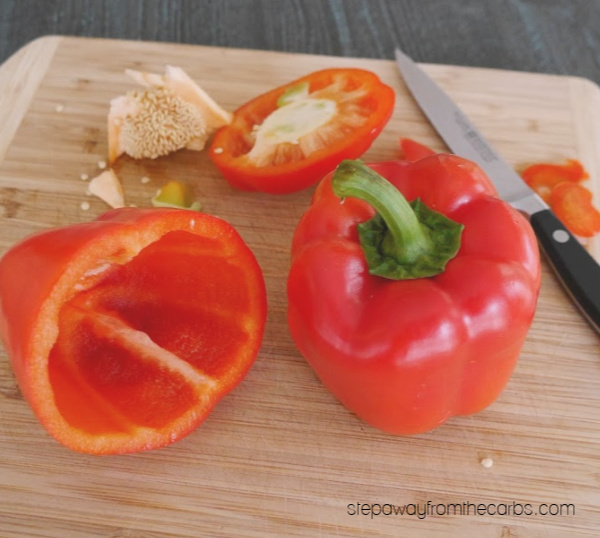 Meanwhile, prepare the peppers by removing the top, then removing seeds and anything else from inside. Also make sure that the peppers can stand up on their bases, slicing off a tiny sliver as necessary. When the filling is cooked, stir in some shredded cheese (I used a mild cheddar – but pretty much anything would work!) and test for seasoning, adding salt and pepper as necessary. Divide the mixture between the peppers. Roast the low carb stuffed peppers in a preheated oven for 10-15 minutes. 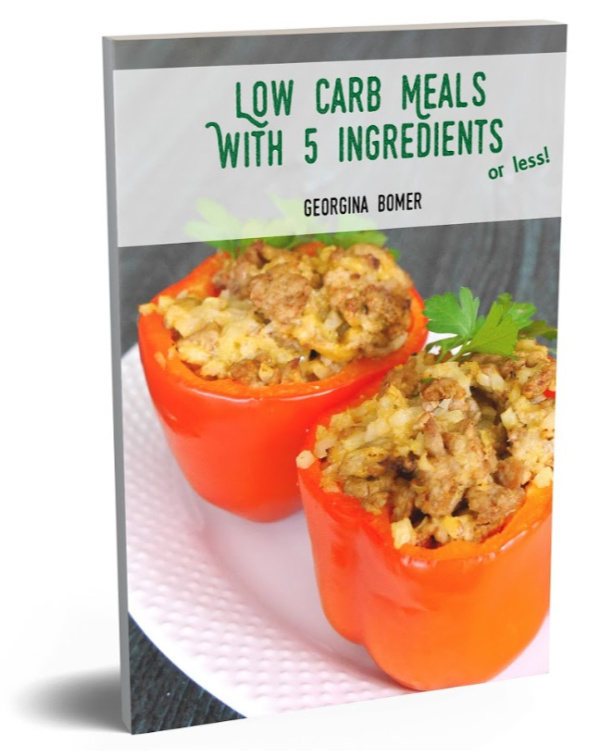 Don’t forget to order your copy of Low Carb Meals With 5 Ingredients Or Less – it’s available in paperback and ebook formats!!! To make the filling, add the oil to a pan and cook the ground turkey until browned all over. Add the paprika and riced cauliflower. Continue to cook until the cauliflower is tender. Meanwhile, prepare the peppers by removing the top, then removing seeds and anything else from inside. When the filling is cooked, stir in some shredded cheese and test for seasoning, adding salt and pepper as necessary. Divide the mixture between the peppers, and roast for 10-15 minutes.